The reproduction of "Dewa-chen" is ready! After I finished to paint "Dewa-chen" last year I went all the way to Barcelona to scan it with high definition scanner. I really would like to find a good scanner around Malaga one day. Though I like Barcelona. For some reason, being Barcelona reminds me Kyoto, in Japan. "Dewa-chen" on the table of huge scanner. 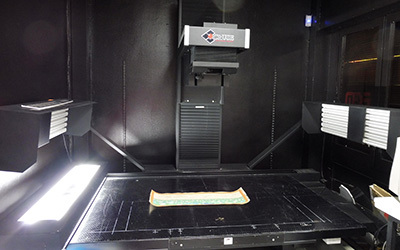 Ready to be scanned. 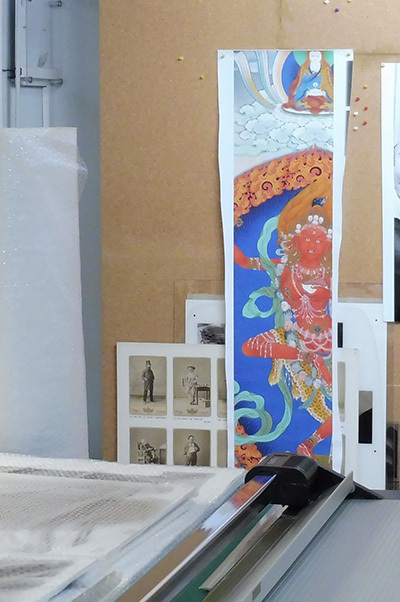 I found a piece of reproduction of my Vajrayogini Thangka from several years ago still shown as an example of their printing. We have made three different version of reproduction of "Dewa-chen" this time. 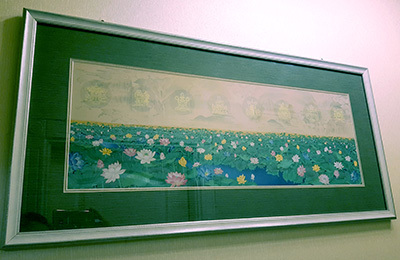 The second version is with the Tashi Tagye, the Eight Auspicious Symbols line up above lotus pond. 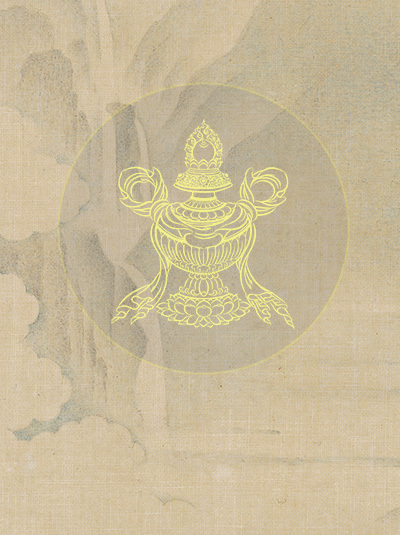 The symbols are depicted with the gold-like yellow lines in a slightly shaded circles. 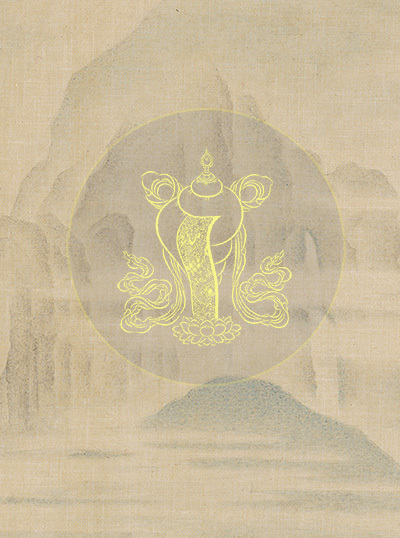 With the Eight Auspicious Symbols, "Dewa-chen" gives off more impression of TIBET without spoiling the tranquil and spatial atmosphere of the original paint. And the third version has even more Tibetan feature. 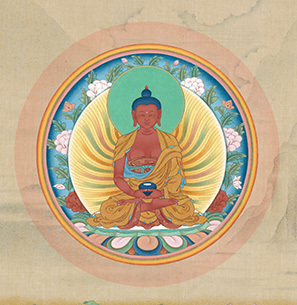 Addition to the Eight Auspicious Symbols, the Buddha Amitabha who resides in Sukhavati, Dewachen in Tibetan, is placed at the center in full color. 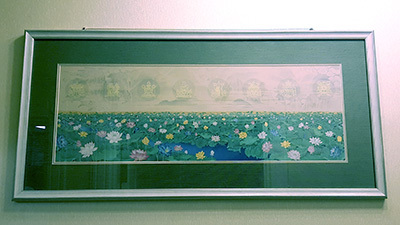 This was the first time I have painted something horizonyally long since most of Thangka paintings are vertically long. I found it quite easily and nicely fitting in many places in the house specially when it's framed in a good frame. Here is one of very nice examples of the "Dewachen" in frame from a friend of mine in HongKong. The one who chose this frame is also a good Thangka painter who graduated Tsering art school in Nepal. She is now teaching Thangka painting in Munsel Thangka School of Art she established in Hongkong. 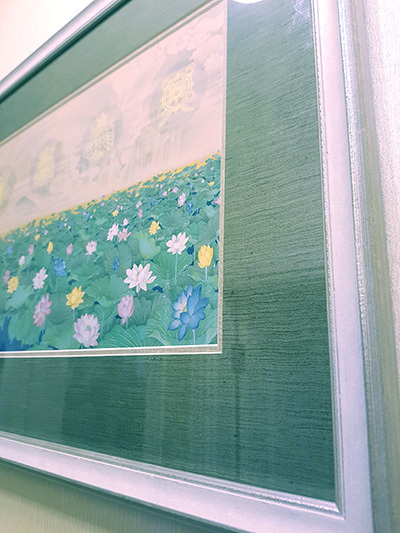 The reproductions of "Dewa-chen" are not yet shown on our online shop. If you are interested, please feel free to contact us via Facebook page.